Reviewing a remaster is difficult. It’s hard not to fall into the trap of reviewing the original game and saying it runs a bit better, so I’m going to be strict and try my best not to fall into that trap – no matter how tempting it may be. Developed by Gearbox Software and out now on Playstation 4 and Xbox One comes Boderlands: The Handsome Collection, though as far as collections go it's not a very good one. It’s like having a shiny Charizard and Venusaur – while you may have two awesome Pokémon, without Blastoise, it’s not really a collection. Call me butthurt, but where the hell is Borderlands? 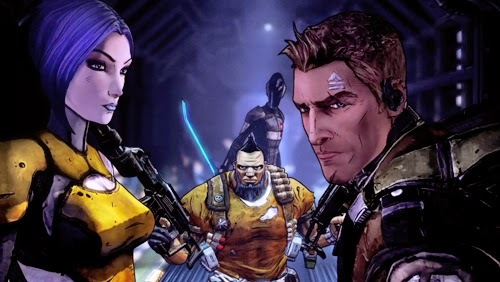 Yes Borderlands 2 is the best, and yes The Pre-Sequel is the most recent and therefore relevant, but where’s the original game, the one that started it all? I’m holding out hope that they’ll release it in future, but perhaps they don’t have the time, resources, or competency to do all three at once. That being said, you do get all the DLC content for each game. Now that is a ton of DLC. The amount of content is (arguably) unprecedented and adds a huge amount of to the collection. Borderlands 2 alone had enough DLC to double the size of the game if you explore it thoroughly. The Pre-Sequel gets all DLC released up to now, which again is enough to significantly extend the amount of time you have to explore the cell-shaded worlds. So content-wise, it’s swings and roundabouts, but what about gameplay-wise. Well, this is a remaster so most of the improvements will be graphical. But that’s pretty hard to tell. In a game where graphics aren’t prioritised because of the stylistic design, there’s not much to improve upon. Sure, it’s brighter and when you look down your sniper scope at an oncoming enemy, you can see the psychotic features in more detail, but that doesn’t really matter when you’re about to blow those features into the stratosphere. The improvements are more noticeable in The Pre-Sequel, where there’s more opportunity to show off with lava pits and laser beams, but even then it seems a bit pointless. The Pre-Sequel also houses a few frame rate issues. In high intensity firefights in which players, enemies and limbs are flinging into space the game lags and struggles to keep up, which shouldn’t really be a problem seeing as it wasn’t back on the old consoles. Borderlands 2 however runs a lot smoother. Combat is more seamless and fast-paced and everything just seems more fluid. Probably down to the improved 1080p graphics and 60fps refresh rate, which upholds in two-player local mode but drops to 30fps when playing four-player local co-op. And that’s probably for the best. Four-player local co-op is just…insane. If you have a TV smaller than 40”, don’t even bother. In battle, there’s just so much going on. It’s a hell of a lot of fun because of the chaos but that amount of chaos is tiring and eventually you need to take a break. Especially on The Pre-Sequel when the frame-rate lags occasionally, the game just feels like it’s panting, begging you to slow down which is distracting and off-putting. What’s more off-putting, and just disappointing, is the way the cross-save works. I say off-putting, because of my experience with it, but perhaps others have had different ones. You have to upload your character from your Xbox 360 or Playstation 3, and then download it from the main menu on your Xbox One or Playstation 4. The only reason I still had my old console was to play Borderlands, so when I heard of the remaster, I promptly sold it. So now I can’t upload my characters. They’re gone…forever. Which felt like a kick to the balls. I’m thankful the option exists for the many who can use it, and I’m sure some have found it very useful, but withholding how it works in the run up to release was a bit foolish. But I suppose, removing myself from the equation, it’s an addition that has made most fans happy. Borderlands: Handsome Collection is 66% of a collection that redeems itself with the amount of DLC available and just to have these huge games to play through again. For fans, Borderlands: Handsome Collection deserves a place in your… handsome collection 4/5.